Since VoIP telephony and all the associated services first hit the market, forecasts have been bullish. Looking back, some of the forecasts were way underestimated and over the last few years, adoption has grown even further. Back around the 2004 timeframe most estimates placed the North American VoIP subscriber base forecast for 2010 at approximately 18-20 million. By the time we got to 2007 most forecasts had increased and at least one had 2010 pegged for over 40 million subscribers. In the early part of 2010, with the year already started, multiple prognosticators had global estimates for the year just pushing past the 100 million subscriber mark. Now with the benefit ofhindsight we can look back and see where we really ended up. 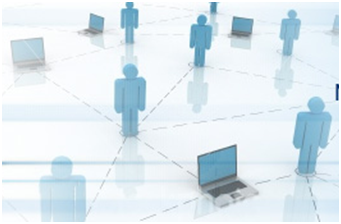 According to a report released by Infonetics Research at the end of March 2011 (VoIP and UC Services and Subscribers), the number of residential VoIP subscribers increased in 2010 to reach 157 million worldwide. The report also predicts continued growth for the next 5 years, with overall service revenue to double during the same period. For service providers who are planning and building out a new infrastructure and equipment manufacturers who must size network elements this presents more than an academic challenge. The only way to adequately plan and size both equipment and networks is to design around an extensible and easily upgradeable architecture. The aim is to ensure that all elements have room to scale, grow and expand while not impacting existing infrastructure or subscribers. This is all much easier to say than to do, but was a key driver for one of Advantech’s customers,themselves a major TEM with significant investments in traditional infrastructure. As they designed their next generation architecture it was crucial that all the delivery platforms had the capacity to expand and grow and could be field upgradable without the need for any major ‘forklift’ activity. The first step for this TEM was the decision to step away from wholly in-house designed platforms and look to source around a standards based model. At that time the PICMG CompactPCI® standard had already gained significant traction and became the obvious choice on which to base the new platforms. Advantech was chosen as the supplier of a number of the platform processing elements. With their close relationship with Intel® and their proven commitment to following Intel’s embedded processor roadmap, this clearly helped breed confidence in the TEM’s design and management team that Advantech would be able to offer the necessary processing upgrades astime went on. Many years have passed since those initial decisions and design-ins. In that time there have already been two different architectural processing platforms applied to the install base. As the need to expand capacity and functionality was identified, the TEM worked with Advantech to bring the latest, state-of-the-art, Intel® processing technology to the CompactPCI® form factor and then on to their customer base. The initial platform was designed around Advantech’s MIC-3369C single board computer. Built around the latest CompactPCI® standards, the MIC-3369C supported a low-power version of the Intel® Pentium® M processor clocked at up to 2.0 GHz., and dual channel DDR2 400/533 MHz SDRAM up to 2 GB with ECC. The MIC-3369C was able to provide maximum I/O throughput with the ICH4’s PCI-X ports and two Intel® 82546GB Ethernet controllers linked directly using 64-bit PCI-X connectivity for a total bidirectionalpeak bandwidth of2 Gb/s. In 2007 staying in sync with Intel’s roadmap and closely following the launch of the top-end T7400 Core™ 2 Duo processor and low voltage L7400 version, Advantech announced its MIC-3392 CompactPCI® blade. Designed with low-power and high performance features in mind, the MIC-3392 was the perfect upgrade option for platforms that had implemented earlier generation Pentium® blades. Advantech’s customer was able to integrate these new blades into their solution and gain performance advantages without changing the basic chassis infrastructure. As Intel’s ‘Tick-Tock’ strategy has continued their processing technology has evolved in a number of dimensions, die size has shrunk, more cores and features have been added. In April of 2012 Intel® introduced the 3rd generation Intel® Core™ processor family (Ivy Bridge). The key variants kept the same names as their 1st generation Nehalem architecture predecessors, the Core™ i3, Core™ i5 and Core™ i7. A series of these processors designed specifically for embedded computing applications was released by Intel®. Based on the latest 22nm process technology these processors feature new levels of performance for embedded, compute-intensive applications and represented a significant step up from earlier architectures. Available in both dual and quad-core variants all versions remained software–compatible with previous Intel® architecture 32 bit processors. All embedded applications are conscious of power consumption and the new embedded options of the chipset are available with TDP (Thermal Design Power) ranging from 17W-45W. Advantech, a premier member of Intel’s Embedded Alliance, had been working closely with Intel® and was able to announce supportfor the new 3rd generation Intel® Core™ processor family with their MIC-3395 blade at the same time as Intel’s embedded launch. 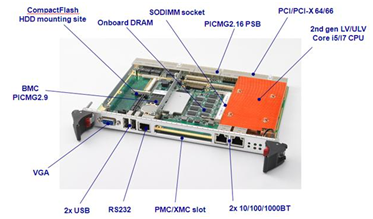 The MIC-3395 is a 6U CompactPCI® single board computer and follows the successful path forged by the MIC-3392 blade using low power mobile processor technology and offers an upgrade path with higher levels of performance and richer features. The board fits in a single 4HP slot and expands memory capacity to up to 8GB of on board DDR3 with ECC support and one SO-UDIMM module for up to a further 8GB. ECC memory is essential in mission critical environments and the uptime of a softswitch is crucial, requiring five-9’s availability or better. Advantech recognizes that the cost of a potential memory error far outweighs the additional memory and system cost to correct it, therefore ECC is standard onour Intel®-based CompactPCI® blades. I/O expansion is ensured via an XMC slot and mass storage is available with onboard 2.5” SATA-III support, onboard CompactFlash and RTM-based SAS storage options. Six independent gigabit Ethernet ports cater for a wide range of integration options with dual GbE connectivity to front, rear and PICMG 2.16 ports. The blade was designed to fit a wide range of markets in addition to telecom and networking but all the same upgradability attributes hold true for all applications. The introduction of the MIC-3395 represents a plug compatible upgrade path with 8 times the memory capacity and more than 12 times the performance of the original Intel® Pentium® M based MIC-3369C. For Advantech’s customer this has provided a whole new lease of life for their installed base, enabling the potential for major performance improvements, new software capabilities and greater channel densities, all without the need to alter the fundamental platform infrastructure.